Michael Jackson fans who bought tickets for his O2 gigs on the internet auction site eBay will receive refunds, it has been confirmed. 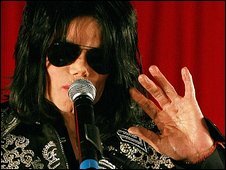 Jackson, who died on Thursday, had been due to perform 50 dates at the London venue from 13 July. Thousands of people who bought tickets on the secondary market site were left wondering if they would get refunds. An eBay spokesman said: "We will ensure all buyers on the site can receive a full refund for their ticket purchase." He added: "The sad news of Michael Jackson's death has left fans of the King of Pop bereft. "eBay is committed to ensuring that no buyer is left out of pocket as a result of the unique nature of the event." Final details of how the exchange will work will be announced next week. On Friday, retailer Seatwave and ticket exchange site viagogo both said they would refund ticketholders. A spokesman for AEG Live, the organiser of the 50 concerts, said: "On behalf of the entire AEG organisation we extend our deepest condolences to Michael Jackson's family and friends during this tragic time. In March, tickets to Jackson's This Is It concerts at the O2 became the "hottest-selling on the planet", according to organisers, with 750,000 fans snapping them up. Concert organisers said they were the fastest-selling tickets in London ever, selling at a rate of 11 per second, with face prices of £50 to £75.